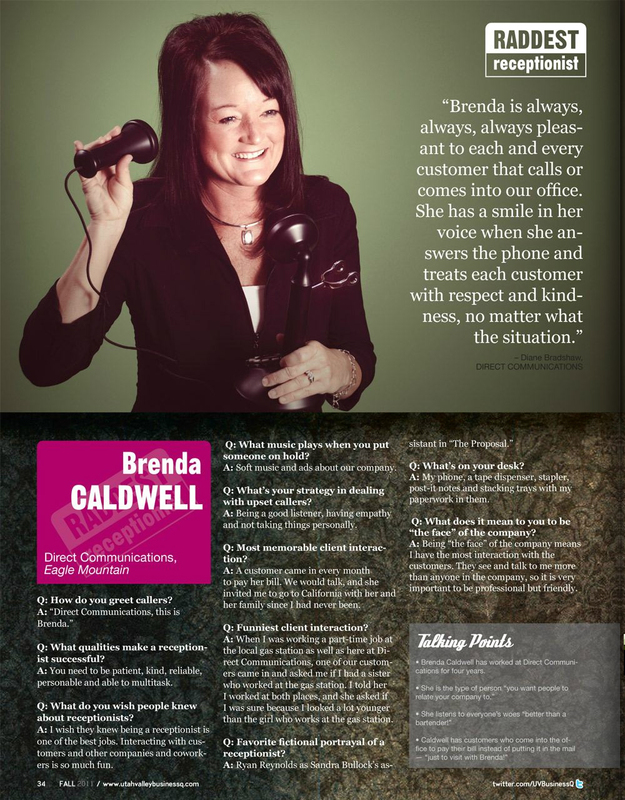 Congratulations to Direct Communications Cedar Valley’s own Brenda Caldwell on being named Utah Valley’s Raddest Receptionist by Utah Valley BusinessQ Magazine. Brenda has been with the company for 4 years, and probably has never had a bad day at the office in all that time–at least from a customer perspective. If you have had any dealings with Brenda as a customer of Direct Communications, you know she is a deserving recipient of this award. Q: How do you greet callers? Q: What qualities make a receptionist successful? A: You need to be patient, kind, reliable, personable and able to multitask. Q: What do you wish people knew about receptionists? A: I wish they knew being a receptionist is one of the best jobs. Interacting with customers and other companies and coworkers is so much fun. Q: What’s on your desk? A: My phone, a tape dispenser, stapler, post-it notes and stacking trays with my paperwork in them. Q: What does it mean to you to be “the face” of the company? A: Being “the face” of the company means I have the most interaction with the customers. They see and talk to me more than anyone in the company, so it is very important to be professional but friendly. Q: What music plays when you put someone on hold? A: Soft music and ads about our company. Q: What’s your strategy in dealing with upset callers? A: Being a good listener, having empathy and not taking things personally. Q: Most memorable client interaction? A: A customer came in every month to pay her bill. We would talk, and she invited me to go to California with her and her family since I had never been. A: When I was working a part-time job at the local gas station as well as here at Direct Communications, one of our customers came in and asked me if I had a sister who worked at the gas station. I told her I worked at both places, and she asked if I was sure because I looked a lot younger than the girl who works at the gas station. Q: Favorite fictional portrayal of a receptionist? Utah Valley Magazine is a trademark of Bennett Communications, Inc.
“Bennett Communications, the parent company of Utah Valley Magazine, is now in its 11th year of publishing. The company publishes four original titles and partners with local organizations on a variety of other projects.